GODDESS – Jennifer Waldron, Ph.D. Lately I’ve noticed sustaining a regular practice of painting, doodling, yoga, meditation or daily walking requires more than sheer stick-to-ativeness (isn’t that a great word?). It can be difficult to rely on just me to get into the stick-to-ativeness because such sheer determination rests in my mind rather than heart and spirit. I was musing about this when painting today: what keeps me coming back to the art studio? 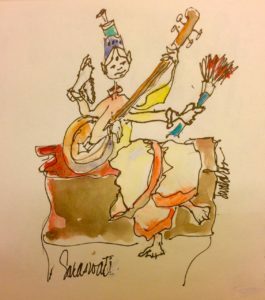 Enter Saraswati. But before I tell you about her, know this: I love chanting. It’s a vocal meditation, offers my voice, body and spirit good energy, fills the space with healing vibration and connects me to all that is divine. I learned and studied chanting before this century began from a magnificent woman, Pat Moffitt Cook. Since then, chanting has become a part of my life. Saraswati is the Hindu Goddess of knowledge, music, the arts and wisdom. And like all the Goddesses and Gods of Hinduism, she has a lot of arms and hands to hold her sacred tools, four hands to be exact: A book for knowledge in one, mala for wisdom in the other, a lyre for music, and a water pot for the river of consciousness that stimulates creation. 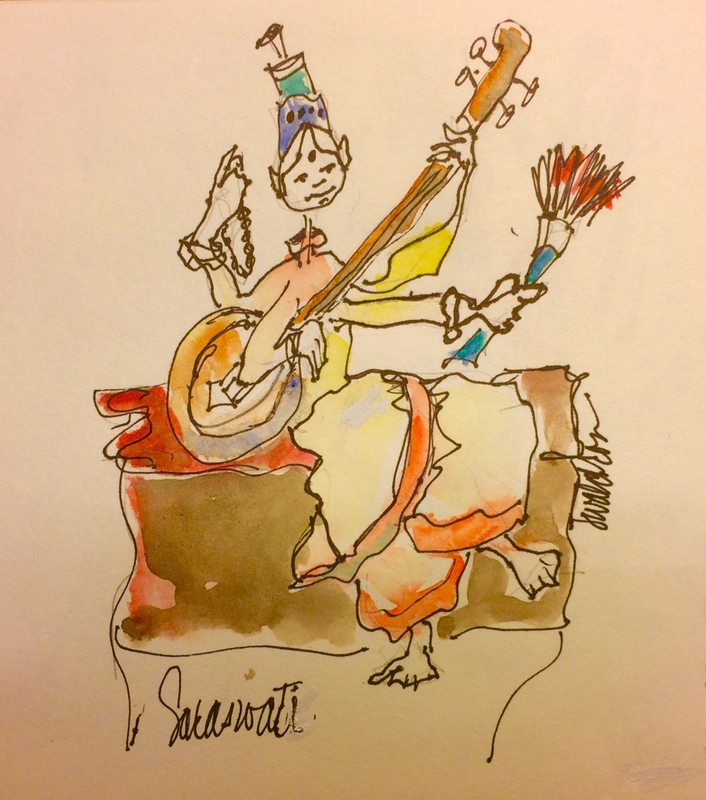 I imagine a fifth hand holding a paint brush every time I sing her sacred mantra: Om Eim Saraswatiyei Namaha. I rely on the spiritual world to help me in the physical world. Chanting is part of that help. When I step into the art studio, the string of love goes beyond what I can see, hear or know. I count on that mystery to give me stick-to-aliveness plus a whole lot of other stuff. Here’s what the mantra sounds like. Enjoy! Oooooo! Wonderful! Thank you for the recording! It sounds so happy! What a great way to infuse positive energy into what we eat. You are the best! Jen, thanks for sharing “what keeps you coming back”. I love listening to the chanting…never thought about that as a 5th hand helping you along. Keep these thoughts coming they are so helpful for us struggling artists. Yes, yes, we all need whatever help we can find!